Sophisticated modular construction enables individual machines to be linked to form integrated processing lines. 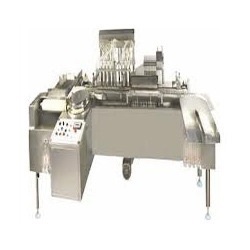 For every output range a selection of machines for washing, sterilizing & depyrogenation & filling and closing is available, customized to suit individual requirements, we design and construct complex production lines for processing ampoule. 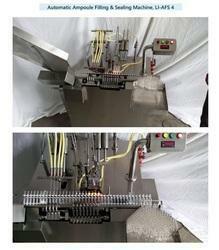 36 stations European ampoule forming machine with after forming line from Morden Mechanics, ensuring higher yield. AMPULE FILLING & SEALING MACHINE: - Simple syringe type hand driven gives ten ampoules per minute capacity filling adjustable from 1 ml to 10ml by a cam lever arrangement automatic intake outflow of fluid all contact parts are borosil glass the sealing apparatus consists of glass fusing burner for LPG or petroleum gas with foot bellow and rubber tubing.